Mary Bergan Blanchard, a Sister of Mercy for twenty years, was sent to Lebanon and taught in a Palestinian camp. Disturbed by social injustice, she left religious life to teach disadvantaged children in Boston where she also received a MEd in Counseling and Psychology from Boston University. Mary married a widower with five children and together they had another son. 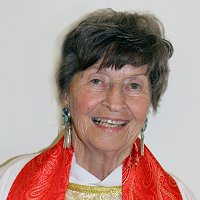 Upon retiring in Albuquerque, she served a parish as a Licensed Professional Counselor for eighteen years. She has written three memoirs. Mary was ordained a priest on May 24, 2014 in Brecksville, Ohio, and celebrates liturgy where all are welcome.